Not the same as a failed launch, of course . . .
Interfaks reports proyekt 955 Borey-class SSBN Yuriy Dolgorukiy cancelled a Bulava test launch on Saturday. According to Sevmash, the power supply to one of Dolgorukiy’s systems malfunctioned. The submarine returned to the factory to investigate. The Interfaks source said the state commission supervising Bulava testing indicated the launch would be put off until late this week. The source emphasized there aren’t issues with the Bulava, which was fully ready for launch. Interfaks recalled the 15th launch scheduled for last December was delayed until June because Dolgorukiy wasn’t ready, although the official reason was White Sea icing. 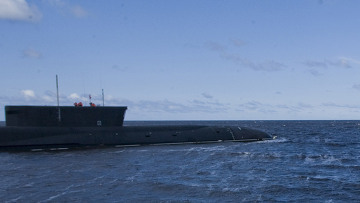 The June launch from the submerged Dolgorukiy was successful. In Moskovskiy komsomolets, Olga Bozhyeva’s source says the problem was a sensor in a system needed to prepare the missile for launch. They postponed until later Saturday, but, when they couldn’t fix it, the SSBN returned to port Sunday morning. The source says the state commission will probably delay the next launch attempt until September. RIA Novosti provided a more official spin on the cancelled test. It emphasized there was no unsuccessful launch. The news agency’s state commission source stressed that, when submarines go to sea for system testing, the commission makes its decisions based on many factors and conditions. And the source stated the Bulava flight test program will be completed in the established time frame. This entry was posted in Defense Industry, Naval Modernization, Strategic Forces Modernization and tagged Borey, Bulava, Proyekt 955, Sevmash, SLBM, SSBN, Yuriy Dolgorukiy. Bookmark the permalink.